Benoa is a ‘tricky’ port; affected by strong tidal currents, having numerous shoals and sandbanks` and involving some sharp, precise turns. Local fishermen are standing in the water only a few meters away from your ship while approaching the dock. Benoa is a relatively new port. At the dock, you will be greeted by Balinese dancers. Most of the ships now dock in the improved port, Some anchor and will tender their passengers ashore. Distance/drive time from cruise terminal of Benoa to town center (Denpasar): 12 km. To the international airport: 10 km. There are many taxis available just outside the cruise terminal, as well as many drivers hawking tours. Bali is not easy to get around since the many attractions are widely spread out over the island and the road infrastructure is poor. The main areas of interest include the Nusa Dusa area which is filled with nice resorts and beaches, Denpasar which is the capital and main market area and Ubud which is the cultural center of the island. You can hire at the pier a car or van & driver for 4 hours for about $65. Make sure the driver speaks some English. Taxi to Denpasar $30, to Kuta $27 and to Nusa Dua about $37. Within the precincts of the terminal there are demonstrations of Balinese art and culture. Dancing, puppets and a Gamelan Orchestra in addition to demonstrations including: wood carving, batik printing, paintings and sculpture. Benoa Harbor has now being developed as a turn-around port, capable of accommodating international cruises that embark or disembark from the island. Note: If your room steward is from Bali, do him or her a favor be requesting that your stateroom not being cleaned. This way he will have time to meet his family. Hotels near the Cruise TerminalCruise calendar for this port. Check here for festivals and events in Bali when you are in port. Kuta Beach is the most popular and developed beach in Bali. Blessed with natural beauty, one of the top attractions for visitors to Indonesia is without any doubt the island of Bali. With its multitude of mountains, volcanoes, beaches, paddy fields, customs, local lifestyle, art, religions and attractions, Bali is popular as a gateway destination. The friendliness of the Balinese makes many visitors feel at home on the island. Geographically, Bali is situated between the Islands of Java and Lombok, and thus boasts a stunning coastline of beautiful beaches for relaxing or waves of international standards for surfing. Nusa Dua is an enclave of large international 5-star resorts in south-eastern Bali. It is located 40 kilometers from Denpasar, the provincial capital of Bali. 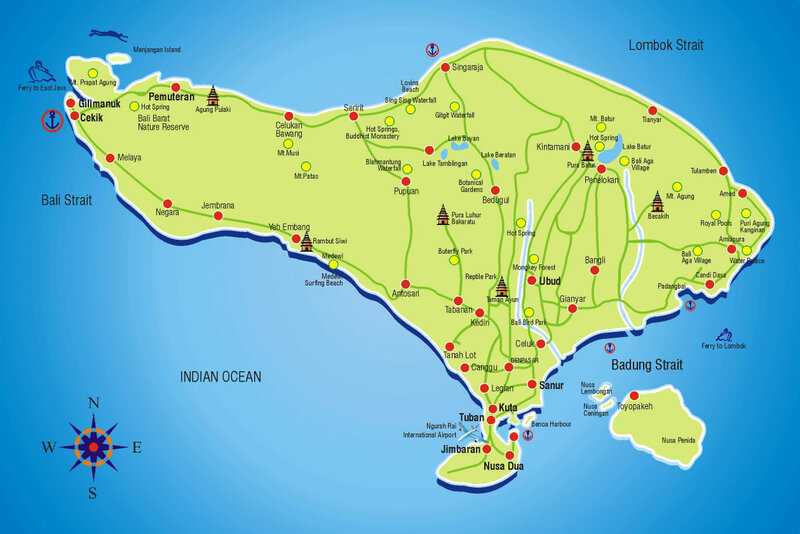 Immediately north of Nusa Dua enclave is the peninsula of Tanjung Benoa that includes less exclusive hotels and Benoa village. A multi-denominational area, it includes a mosque and Chinese and Hindu temples in close proximity. Every house has a temple - in the grounds of a big house it can be a very impressive building, in artisan houses it'll be just a cupboard. Take small change for any village temple. Unlike most of Indonesia, most of Bali is Hindu. You will probably find areas like Ubud, Celuk, possibly Sanur etc appealing but more enjoyable done with a driver or very small group. If renting a car you will an International Drivers License. Infrastructure is rather poor. There are some small stalls set up in the cruise terminal and souvenir sellers outside the terminal gates. Be careful when using credit cards, as cloning and fraud are a major problem in Indonesia. Visa and Mastercard are widely accepted, but American Express can be problematic. At smaller operations, surcharges of 2-5% over cash are common. Australian as well as US dollars are widely accepted. A note about male names in Bali. Male children are named by their birth order. The first is Wayan, the second is Mate (pronounced mah-tee), the third is Komang, and the fourth is Ketut. If there are more than four, they begin again with Wayan. Each male also has a middle name, and they may choose to go by that name. Free Wifi internet connection is available in the cruise terminal of the East Berth.